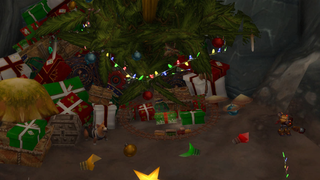 So there's a mechanical corgi in the cave near Metzen the Reindeer? And it's been there for years? Too bad it's not obtainable as an actual pet or toy, but there it is, well-hidden among all the other stolen stuff. Crendor has this and 9 other fun things in WoW's holiday event in his latest machinima. Although the clip has it all, I'd add one more thing that was only possible to do for a day or so due to a hotfix: Blocking the path to the seasonal quest givers and vendors with your enlarged mount (see the mammoth below?). Alright maybe that deserved the hotfix (you can no longer enlarge yourself while mounted), but mailing coal to your friends in gift wraps always works.